The Conservative government has tabled a 443-page bill, the second one to implement its federal budget, which includes changes to 64 pieces of legislation, including public sector and MP pensions. Talk immediately turned to whether the government would split the bill, with the NDP and Liberals accusing the Conservatives of trying to hide controversial changes in Bill C-45, the jobs and growth act, by drawing attention away with the changes to MP pensions. New Democrat MP Peggy Nash says the bill is too long and the tax cuts aren't tied to job creation, which the NDP would like to see in the legislation. NDP House leader Nathan Cullen warned that if the government is looking for a fight, it'll find one. "If the government wanted a prolonged fight, what you do is create complicated, cumbersome legislation that's difficult for Canadians to understand, ram it into one committee and refuse to divide it into its parts," he said. "If the government were proud of any of these changes to the environment, or changes to research and development, these would be stand-alone pieces of legislation. You've seen these guys work. When they have a bill that they're proud of, it's balloons and champagne and lots of access. When it's something that they want to hide, they dump it in an omnibus bill." The government tabled the bill Thursday morning but didn't provide a background briefing for reporters on what would be in the legislation, instead holding three separate press conferences to highlight different aspects of it. Asked whether he'd be willing to split the massive bill so MPs can vote separately on pension reform from the other measures, Finance Minister Jim Flaherty said no. "There's no surprise there for anyone who bothers to inform themselves about what's in the budget. So I hear the opposition say that [they want it split] but it's really quite self-serving and it shows, it seems to me, a lack of diligence in actually studying what's in the budget. There are no surprises here." But Interim Liberal Leader Bob Rae said his party is prepared to vote for the MP pension changes now and is even ready to talk about bringing them in sooner than 2017. Prime Minister Stephen Harper is seriously considering the offer, a source told CBC News. The proposed changes to public-sector and MP pensions, Flaherty said, would increase to 50 per cent the amount public servants and MPs pay into the retirement funds. That change will start as early as Jan. 1, 2013. Treasury Board President Tony Clement said the changes will save $2.6 billion over the next five years. MPs will also have to wait until age 65 to start collecting their pensions, or be penalized if they start at age 55. New federal workers will have to wait five years longer than they do now and retire at 65. The precise date for MP pension changes is Jan. 1, 2016. There will be no change to the current eligibility for MP pensions of six years of service. The omnibus budget bill contains a number of measures that were left over from last spring's federal budget. But, contrary to what Flaherty has said, other changes fall outside of the budget tabled last March. 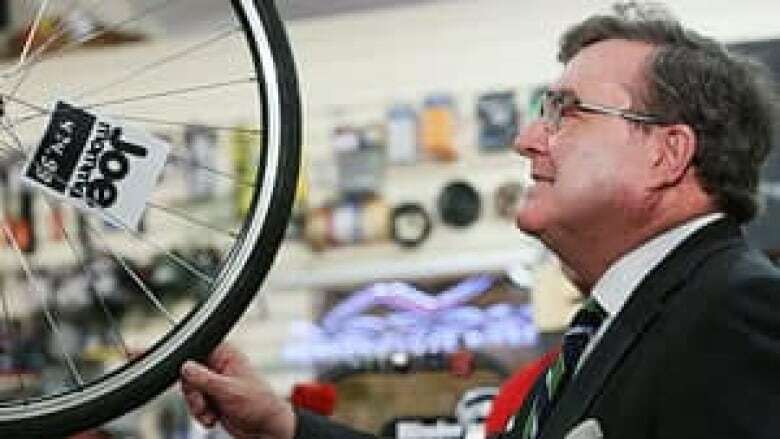 "Frankly, I think it's a bit dishonest on the part of Minister Flaherty to say that there are no surprises in the budget," Rae said. "There are always, in a Conservative budget, in a Conservative measure, surprises. That's why for us we really need the opportunity to study it." The bill makes changes to the Navigable Waters Protection Act to rename it the Navigation Protection Act and to limit its application to three oceans, 97 lakes and 62 rivers across Canada. Transport Minister Denis Lebel said the changes will allow for the building of infrastructure such as bridges without need of federal approval in most cases. The changes also exempt pipelines and interprovincial power lines from the act, so that environmental assessment hearings for them would not have to consider whether they would affect or interfere with any water in Canada. Pipelines and power lines will continue to be subject to other federal and provincial approvals. "Nothing in this navigation proposal will have any impact on NEB-regulated pipeline approvals," Lebel said Thursday evening in a statement. The NEB deals with technical issues only — not environmental ones. Lebel said Thursday afternoon the act was never intended for environmental protection, but Green Party Leader Elizabeth May says that isn't true. "I would say that what Mr. Lebel says is what he's told to say by Stephen Harper," May said. "And the destruction of the Navigable Waters Protection Act and renaming it the Navigation Act is part of a consistent pattern of Stephen Harper trying to remove federal constitutional authorities for the environment. Mr. Harper clearly does not believe the federal government should be responsible for environmental protection, so they're trying to rewrite history." Last spring's changes to the Environmental Assessment Act are tweaked further in this omnibus bill. The bill makes what could be controversial changes to the Indian Act, amending it to change the rules around what kind of meetings or referendums are required to lease or otherwise grant an interest in designated reserve lands. The amendments would allow First Nations communities to approve a land designation by a majority of votes from those in attendance instead of waiting for a majority from all eligible voters, in essence putting the onus on First Nations to show up to vote at meetings or referendums. The aboriginal affairs minister would be given the authority to call a band meeting or referendum for the purpose of considering an absolute surrender of the band's territory, and to accept or refuse the land designation after receiving a resolution from the band council. The changes are intended to move up the land designation process by several months, allowing First Nations who want to take advantage of economic opportunities to do so more quickly, a government official says. C-45 also facilitates the construction of a new bridge across the Detroit River at Windsor, announced by the prime minister last summer. Certain legislation will be changed and other legislation won't apply to this bridge. The Merchant Seamen Compensation Board will see its authority transferred to the labour minister. The three-person board hears and decides benefit claims for merchant seamen injured or disabled on the job who are not covered by provincial workers' compensation benefits. The Canada Employment Insurance Financing Board will be dissolved and an interim means of establishing EI premium rates will be set up to replace it. The Crown corporation is run by a seven-member board. This move continues EI changes started with the first omnibus budget bill, as cabinet gradually receives more authority over EI. All the work of the Hazardous Materials Information Review Commission will be transferred to the health minister. The bill also amends the Canada Grain Act, simplifying the way it classifies grain terminals, repealing grain appeal tribunals, and ending several other requirements of the current act, giving the Canadian Grains Commission more power to regulate the grain industry. These changes follow the end of the Canadian Wheat Board's monopoly over wheat and barley sales in Western Canada, which take effect for this year's harvest.